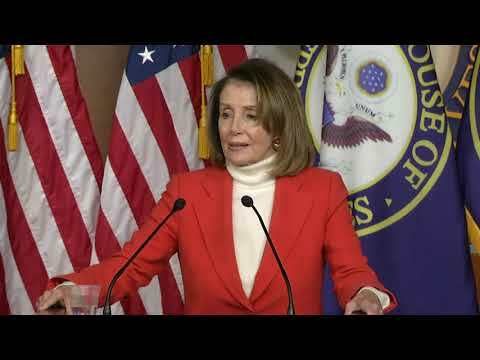 WASHINGTON (AP) — Lawmakers trying to oust Nancy Pelosi started rallying behind a possible contender Thursday, but the House Democratic leader gained key endorsements and said she has “overwhelming support” to become the next speaker. Pelosi picked up backing from Rep. John Lewis, D-Ga., the civil rights leader, while a who’s-who of Democrats — including former Vice President Al Gore and former Secretary of State John Kerry — advocated on her behalf. One member of the Black Caucus, Rep. Marcia Fudge of Ohio, indicated a willingness to run against Pelosi for speaker when lawmakers return after Thanksgiving for first-round voting. She’s an ally of Ohio Democratic Rep. Tim Ryan, who mounted an unsuccessful campaign against Pelosi two years ago and is a leader of the current effort to topple her. Others may jump in, but have not yet. Pelosi has faced challenges before but this one — fueled by newcomers calling for change and frustrated incumbents who feel shut out of leadership after her many years at the helm — poses perhaps the biggest threat yet. With a narrow Democratic majority, now at 230 seats, she does not have much cushion to secure the 218 votes needed on the floor if all Republicans vote against her, as expected. Some House races remain undecided and the Democratic majority could grow slightly. There is a chance the math could shift in Pelosi’s favor if lawmakers are absent or simply vote “present,” meaning she would need fewer than 218 votes for an absolute majority. The full chamber will elect the next speaker Jan. 3. The 78-year-old Californian was bombarded with questions about the speaker’s race at her weekly press conference Thursday. “I intend to win the speakership with Democratic votes,” she said. Asked if sexism might block her return as the first woman to hold the office, she countered that’s a question for the mostly male lawmakers signing a letter against her. “If in fact there is any misogyny involved in it, it’s their problem, not mine,” Pelosi told reporters. Seventeen Democrats, led by Rep. Seth Moulton D-Mass., have pledged to vote against Pelosi’s return as the first female speaker of the House. The list includes a dozen incumbents and five newcomers, including two Democrats whose races have not yet been decided. Confirmed by an aide to one of the organizers, the list was first published in the Huffington Post. It includes just three women. Rep.-elect Jeff Van Drew, D-N.J., said he signed the letter and is sticking and with his campaign promise to not vote for Pelosi — “not in the caucus and not on the floor,” he said. Allies of Pelosi have churned out endorsements daily, with support from incoming House committee chairmen; leaders of outside organizations, including women’s groups and labor unions; and others who align with Democrats and provide resources for elections. Many attest to Pelosi’s skills at fundraising for the party, corralling the caucus and delivering votes. Her supporters say now is not the time for infighting when voters expect Democrats to stand up to President Donald Trump. But Pelosi also acknowledges the discomfort some lawmakers face because she’s the GOP’s favorite election-year villain. Some 137,000 ads were run against her this election cycle, she said. “It makes it hard on the candidates,” she conceded. “People don’t even know who I am — an Italian-American grandmother with lots of energy, a mother of five, a grandmother of nine — who is here to do what’s right for our future,” said Pelosi. The letter-writers, led by Moulton, Rep. Kathleen Rice, D-N.Y., and others, have yet to present it publicly. They promise to do so soon, but Rep. Kurt Schrader, D-Ore., said they were hoping to add a few more signatures. Schrader said it’s a “lie” that Pelosi already has secured enough support, and that he would back Fudge. “She has experience in running caucuses, fits the profile I think really well, she’s tough,” he said. Democrats seeking to block Pelosi argue it’s time to give younger lawmakers a chance to rise to high-level posts. They also say Republicans have done such a good job demonizing Pelosi that it’s hard for Democrats to be elected in closely contested, moderate districts. No declared challenger to Pelosi has emerged, but the group agitating for changes says there would be plenty of candidates should her bid be derailed. Pelosi made history when she became the first female speaker of the House in 2007. She assumed the post after Democrats took control of the House in midterm elections during former President George W. Bush’s second term. As speaker under former President Barack Obama, she played a crucial role in passing the Affordable Care Act. This year, many Democrats won after running campaigns focused on health care and preserving the law’s insurance protections for those with pre-existing health conditions. Associated Press writers Laurie Kellman and Mary Clare Jalonick contributed to this report.